I mentioned earlier that I had my first Ulta experience over the weekend, and one of the things I picked up was Essence Underwater. This is a nice slightly muted, little bit dusty teal creme with very, very subtle brighter blue shimmer. This is my first foray into Essence polishes, and I thought the brush--although not bad--was a little less than desirable, the formula seemed nice (2 coats), and the 99¢ price tag was even nicer! Nothing too extraordinary, but I'm sure I'll buy more from this line in the future. Below: But this. Ooh, pretty! I was on the phone in my darkened office talking to one of those relatives that you really don't want to pick up for when you see the number on the caller ID--c'mon, I'm not a bad person, really I'm not! But maybe you have one of those relatives too, so you can relate! Anyway, I put on the Essence color in the dark, managed to photograph it, all the while half-listening to the voice on the phone that sounded much like that of Charlie Brown's teacher. Then I decided to put 2 coats of Massini/Studio M/aka Color Club Tinsel Time over the Essence. 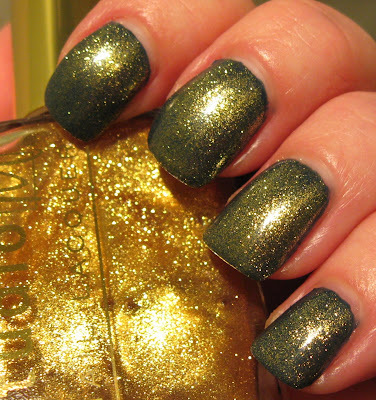 This is such a gorgeous polish with a very pale gold almost clear base and an abundant amount of fine gold glitter. I'm looking forward to playing with it as a top coat over other shades. Look at that liquid gold in the bottle! Tinsel Time is from Studio M's Cozy Up To Color Holiday 2010 Collection. It turned the teal into more of a green shade and it added sort of a gold patina look. If you're familiar with the shade Wild & Willing from Color Club's Wild at Heart Collection, Tinsel Time has a similar concept. The color itself is sheer, but it has the same slight duo chrome tendencies as Wild & Willing--not that either are true duo chromes, because they're not. But the color on both shades shifts around over the nail giving the illusion of duo and multi chromatic looks with subtle color changes. Oh goodness I want that gold so bad! Any chance of it becoming available in your shoppe? Or would you like to do some sort of trade for Cosmetic Arts polishes? Thanks! Aurora's Nails~glad you like it! It was gorgeous in the bottle, but you never know until you put it on! i would gladly pay for a bottle too! 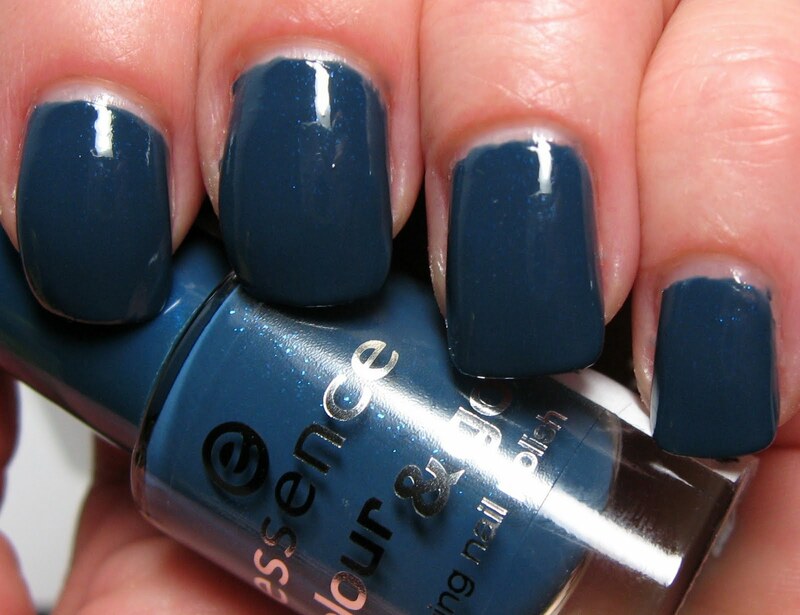 Love the Essence polish. Pretty shade. Love the dusty ones! That gold is amazing. Changed that teal into a green. Love it. Wow that gold topcoat looks amaaaazing!